The first time that I was old enough to stay home sick from school by myself I almost burned the house down. My mom called me from work to check on me a few times. I got hungry and wanted some soup but I didn’t really know how to make it. While I was on the phone with her she walked me through putting the soup into the pot, adding a can of water and then heating it up. She told me to let it simmer for a few minutes and I hung up the phone. A little while later she called again and woke me up from a nap I was taking on the couch. We talked for a little bit and then she asked me how the soup was. “Umm… I don’t remember eating the soup.” I then ran into the kitchen to find a smoking pot of dry blackened noodles. I tossed it into the sink and filled it with water. I then had a peanut butter and jelly sandwich instead. Hehe, blackened noodles. I did that too. Biff hasn’t had a very good time with explosive forces lately. well i recently finished reading through all the comics, all 250 of them, i shall follow his hilarious mishaps from now on, as of this post i have a friend looking through it, i think you may have two new readers! and random guy, Thats nice to know, aluminum foil gas, ALUMIGAS! My cousin did something similar, only his end result was almost catching the kitchen on fire as the pan caught on fire. Had I not smelled it we would have no kitchen. Needless to say he is no long allowed to cook in out house. Ever. Well, at least the noodles didn’t actually catch fire. Did you know dry spaghetti is very flammable? I didn’t, until about seven years ago. It’s not *that* flammable. It takes longer to light via toaster than a cigarette does. Biff is a cloud now? my grandma put an egg in the microwave it blew up the pan that it was in,ohh and chris can you explain this comic to me,idont get it. It’s funny that you should mention that while I’m staying home sick at this moment. Actually, I was just about to make some soup. ^^; Now I’m afraid to. Why is Biff a cloud? Did he insert himself into the microwave again? He’s not a cloud. That’s just his head. The cloud is in the background. So, he’s “condensed” to just a head. I think everyone has had that horribe experience. The saying “A watched pot never boils” has probably destroyed more kitchens than anything. For me, it was a pot of water for making spaghetti. All that was in it was salt. Next thing I knew, I had an empty pot with a horribly pitted bottom, meaning that as well as a few other people here, I’ve literally “burnt water”. Heh, my dad was boiling water to cook something once, and forgot about it. Came back to the kitchen an hour later and the aluminum pot had melted (melted!) to the heating element. Great big blobs of aluminum stuck to it. Had to pry it off the stove. Sometimes I’m stupid. Biff’s eyelashes have been a source of fascination to me for months. Seeing his shoe with the untied laces in proximity to Biff’s head gives me certainty that Biff ties his eyes shut at night. Belatedly, it makes sense to me now. My curiosity is assuaged! So if the cloud is actually in the background, I guess that means he blew up? 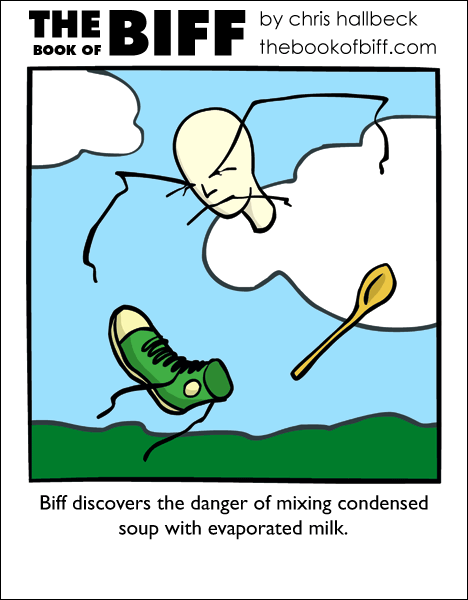 I’m not sure how condensed soup and evaporated milk would do that. I figured he was stuck inside a cloud, or was a cloud, because of the evaporation and the condensation, a process that creates a cloud. My cat is giving me the evil eye. It has nothing to do with ths comic but I just thought you all would want to know that. There was a time where the oriental style pan thingie was loaded with olive oil on the pan…freaking thing ignited like a turbojet on afterburner. I was in my room and even THAT turned orange from the sudden blast of flame. It looked so cool from my room. The kitchen walls…not so much. O wow do I get points for spelling too? Ok not that many, but still I think this is a sign of me needing sleep. once I lefy some cream of mushroom soup on for like almost an hour before I relized I had forgotten it 🙂 It was on low though so nothing caught on fire and I got my soup. I must find a way to use this alumigas to my advantage. i made grilled cheese wrong in a frying pan. i broke the pan somehow and had to buy my mum a new one. I once put a pot of spaghetti on the stove, then went upstairs. The smoke alarm reminded me it was there. Not only was the water boiled out, but the extremely cheap pot has warped, and the spaghetti was melded into the metal. I threw it out, but now I wish I’d kept it. It would make a great kitchen decoration. I once burned a plate of french fries in the microwave. The auto reheat cycle uses humidity and a few other things to know when to stop. Unfortunately, fries, not a lot of moisture in those. I walked into the kitchen when about an hour had gone by and I realized I’d not eaten my fries. They were rather burnt, and stuck to the plate. Actually it’s not alumigas it’s Al (g).